“The Best Sports Stag in the Country” has hosted some of the biggest names in baseball, including Johnny Bench, Joe Morgan and Sparky Anderson, eight other baseball hall of famers, and Joe Torre, Marty Brennaman and Joe Nuxhall. Leyland managed against last year’s Stag speakers, the Nasty Boys – Norm Charlton, Rob Dibble and Randy Myers. 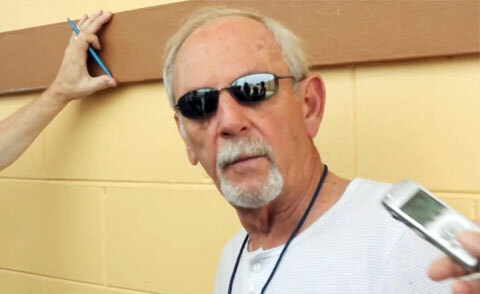 Watch Jim Leyland speaking with reporters at Joker Marchant Stadium in 2014. Leyland led the Florida Marlins to a World Series championship in 1997, and previously won three straight division titles (1990, 1991, and 1992) with the Pittsburgh Pirates. With the Tigers’ victory in the 2006 American League Championship Series, Leyland became the 7th manager in history to win pennants in both the National and American Leagues. He is a three-time Manager of the Year Award winner, twice in the National League (1990, 1992), and once in the American League (2006). He currently serves as a special assistant to the Detroit Tigers. Playing Field Promotions is a booking agent for motivational sports speakers and celebrities. If you would like to book Jim Leyland for a speaking engagement or personal appearance, contact Jim Leyland’s booking agent for appearance & speaker fees at 1.800.966.1380.